Times flies when you're having fun. And they've been having fun while making good beer at The Commons since 2011. 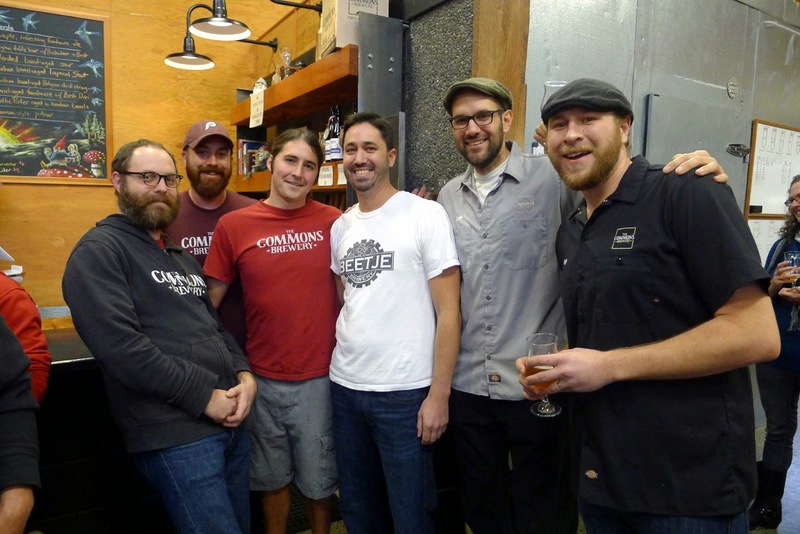 They're holding a party to celebrate their success this coming Saturday, Dec. 6, at the brewery on SE Stephens. When Mike Wright decided to start this place three years ago, he had no idea how successful his little business would be. Today, The Commons has earned widespread respect for its line of Belgian-influenced beers, some of which have won medals at the World Beer Cup and GABF. Their beer is widely available at stores, restaurants and finer watering holes in Portland and beyond. 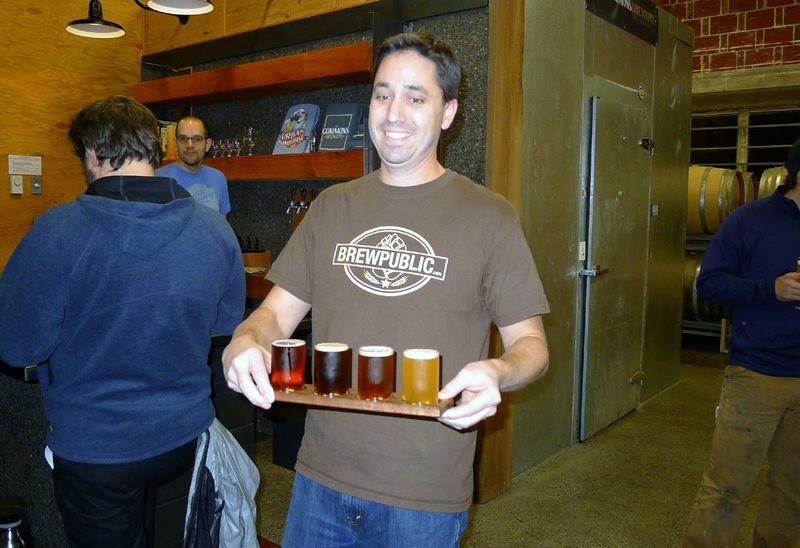 There are those who think opening a brewery is the secret to great wealth and adoration. But building a brand in the hyper-competitive craft beer marketplace is an arduous task, even if you have great beer. Wright and his compatriots, Josh Grgas, Sean Burke, Travis Sandoval and others, have leaned on their expertise and a lot of hard work to make The Commons what it is. 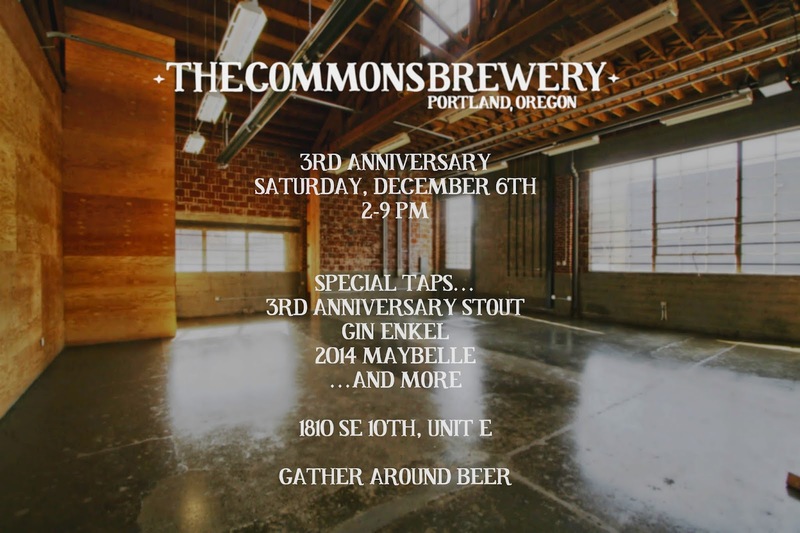 This year's anniversary celebration will be the last in the brewery on Stephens. As most who read this know, Wright and Co. have been diligently working on a new and significantly larger space on SE 7th and Belmont. They hope to be open there by the spring, though they are realistic enough to know these things don't always happen the way you plan. There will be no bottleshare this year. That had a been a prominent and well-attended event the past two years, and will return once they are in their new space. It seems the current landlord is uncomfortable with use of the common areas in the building. That's unfortunate, but somehow understandable given the appeal of these events. Regardless, the beer list for their Third Anniversary is really fantastic. Urban Farmhouse: The flagship saison has been on tap #1 since the day the brewery opened. Buckwheat Grissette: Belgian table beer with Buckwheat and Brettanomyces. Trillium: Blended farmhouse ale aged in Pinot Noir barrels with Brettanomyces Bruxellensis, Brettanomyces Lambicus and house grown cultures. 3rd Anniversary Stout: Imperial Stout featuring 10 different malts aged in Bourbon barrels previously used for Bourbon Little Brother and Brotherly Love. 2014 Bourbon Little Brother: Sneak preview of their popular winter bottle seasonal. Belgian Dark Strong Ale partially aged in Bourbon barrels. 2014 Maybelle: Farmhouse ale aged in wine barrels with BSI’s Brettanomyces Bruxellensis variant Drei. Putin from the Wood: Baltic Porter aged in Bourbon barrels. Pils: Northern German Style with Perle and Spalt hops. Gin Enkel: Possibly the last keg of one of their most popular beers. Belgian table beer with spelt and rye aged in fresh Old Tom Gin barrels with apricots. Dark Czar: One off Baltic Porter/Imperial Stout blended with Stumptown Guatemala Finca el Injerto coffee and vanilla beans. The party gets underway at 2:00 p.m. and will run through 9:00 p.m. or so. Obviously, this isn't the only beer event in the city this weekend, but it will be a good one. You aren't going to have a better opportunity to Gather Around Great Beer, a slight modification of The Commons tagline. Come toast the success of this humble brewery.